We’ve read your review, and we are disappointed to learn of the issues you’ve encountered with your installation. We would like to follow up with you if you continue to have questions or concerns. We can be reached at customersupport@empiretoday.com. 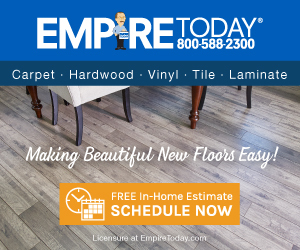 Empire installed the hardwoods in the house I just bought. When we took off the baseboards to do custom painting, the wood does not go all the way to the wall. The installers covered up their failures with an inch wide quarter round. So we have big gaps all around the baseboard, which means more baseboard installations. Awful work. Any problem they put a transition bar, so I had speed bumps all around the area, too lazy to smooth it out and match the work. No way to fix it without complete tear out or multiple baseboards. I didn't like: Quality of the job. Review #652347 is a subjective opinion of User652347. As a flooring installer I want to let you know that's how you do it unless you request or take the wall base off otherwise it is next to impossible to install, maybe you should try it ice to understand the products. You are an ***. Wood must have 1/4" to 1/2" from the wall or baseboard to expand and contract with changes in the home humidity. Google it. We’ve read your review, and we are disappointed to learn of the issues you’ve encountered with your installation. We can assure you that this is not what we expect for our customers, and we would like to know more about the situation and work towards a resolution with you. Unfortunately, we cannot locate your account with the information posted here. Please send your contact information to customersupport@empiretoday.com so that we can follow up with you.